Here are some hear-sees of the day! Two regular season games will be held at London’s O2 area this year. The New Jersey Nets and Toronto Raptor’s will play in March, however the trip has not been confirmed as annual occurance. Barack Obama became an honorary member of the New Orleans Saints when Reggie and the crew hit up Washington D.C.
Billy Devaney, GM of the St. Louis Rams, sang Bradford’s praises at their first scrimmage last Saturday. There is a tournament coming up at UCLA in honor of the late John Wooden. I’ll get more details on this soon and will post! 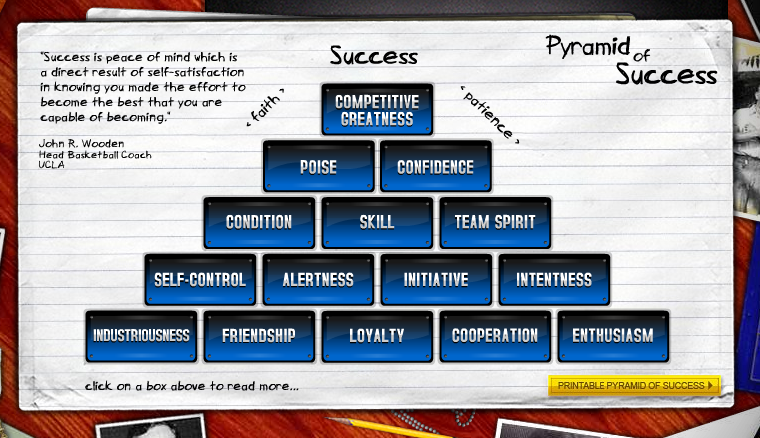 Go ahead and check out John’s “Pyramid of Success.” He is truly someone to live by! I got to view this train wreck in person. Apparently Zac is deaf, because if he would have heard Vanessa’s rendition of “Out Tonight,” he wouldn’t have offered up $20. However, I give V-Hudge credit for her dance moves and Zac credit for being a supportive boyfriend. She was working hard (and he was probably aroused)! Regardless of her performance, she wins it all because she goes home to that beautiful human being every night. Sigh. He’s too pretty. PS: I’m not kidding when I say she was not even close to doing this role justice. See Vanessa perform here, then her Broadway counterpart. Katy Perry doesn’t like her ex-boyfriend? Shocking! Considering Travis McCoy (Gym Glass Heroes) was a bipolar, prescription pill popper/alcoholic, I’d venture to say they had some pretty rough times in their relationship. Thankfully, Travis has gotten help. While Katy is engaged, that didn’t stop her claws from coming out, having “therapeutically” written a song about Travis entitled “Circle in the Drain.” Must of been a real special evening last night when Katy hosted the Teen Choice Awards and Travis performed. Can’t we all just get along? Forget fist pumping, I’m sure there were a lot of hearts pumping when this six foot shark washed up to say hello to the Jersey Shore. Maybe he was trying to end Shark Week with a bang?